Get aboard of a wonderful catamaran and enjoy the best beach of the island, a private location with white sand, full of palm trees and natural eco-ambiance. Discover the underwater wonders of Isla Mujeres in one of the great reefs at the Caribbean. Your tour will begin in the Cancun hotel zone. You will be greeted at the departure point for your day tour, where you will board the "Albatros". The Albatros is a sail powered 70 foot catamaran and you will Sail Away to Isla Mujeres for an unforgettable day. The bar opens the moment you step on board and the fun begins. 10:00 to 11:00 am: Sail away to Isla Mujeres - time will depend on the winds on that particular day. 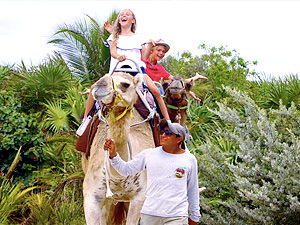 11:00 to 11:45 am: Snorkeling in the Marine Park "El Farito"
12:00 to 1:15 pm: Visit and shopping in the town of Isla Mujeres. Open bar: Tequila, Rum, Vodka, Beer, Soft Drinks, Juice and Water) no cocktails. Suntan lotion, a cover up, sunglasses and a hat.